What is WPI 845 pill? WPI 845 is an imprint on a white, round pill containing glipizide extended-release 10 mg. It is a sulfonylurea and is used in the treatment of diabetes mellitus 2. It is supplied by Watson Laboratories, Inc.
Labeler / Supplier: Watson Laboratories, Inc.
WPI 845 pill contains a single active ingredient, glipizide in 10 mg strength. It is a whitish, oderless poweder whichi is is insoluble in water and alcohols, but soluble in 0.1 N NaOH. The extended-release tablets are formulated as a polymer matrix. Drug class: Glipizide is an organic compound belonging to group known as benzenesulfonamides. These compounds contain a benzene ring which is attached to sulfonamide group through an S-linked covalent bond. Glipizide extended-release tablets are indicated in type 2 diabetes mellitus as an adjunct to diet and exercise to improve glycemic control. Type 1 diabetes mellitus or diabetic ketoacidosis. These conditions should be treated with insulin. Renal and hepatic disease: Metabolism and excretion of drug is affected, so dose should be reduced. Hypoglycemia: Risk of developing hypoglycemia increases with fasting, after severe or prolonged exercise, when alcohol is ingested, or when more than one glucose-lowering drug is used. Hemolytic anemia: Glipizide can induce anemia in individuals with G6PD deficiency as it is a sulpha containing drug. WPI 845 pill is not a controlled drug under the controlled substances act as neither glipizide nor any of its inactive ingredients are known to cause addiction. It is a prescription only drug. What are different brand names for glipizide? Metronidazole 500mg is a reasonably priced drug used in type 2 DM for glycemic control. This drug is covered by most Medicare and insurance plans. Without insurance the pill will cost you $27.65. This is the average retail price and the actual price will depend on from where you buy the drug. On GoodRx, the cheapest and most common version of glipizide extended-release is around $9.99. Glipizide stimulates the release of insulin from beta cells in the pancreatic islets. They do so by blocking the potassium channels present at the cell surface membrane of these cells. This will cause potassium to build up inside the cell. Eventually, there will depolarization of the cell which will cause insulin to be released. There are two other extra-pancreatic effects of glipizide as well. It is thought to increase insulin sensitivity and decrease hepatic glucose production (gluconeogenesis). 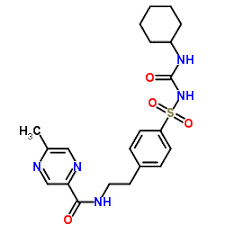 However the mechanism/s through which glipizide achieves this have not been identified. There is wide variation how a patient will respond to this drug. Some don’t respond initially while some lose their responsiveness to sulfonylurea drugs, including glipizide. The reason behind this is that insulin secretion will depend on the state of the pancreas. If the beta cells are completely worn out or become worn out with time, the response to glipizide will be completely absent or decrease with time respectively. Can WPI 845 pill cause dependence? WPI 845 pill does not cause dependence. As a result it is not a controlled substance. Absorption: The bioavailability of fenofibrate after oral intake is high, around 90%. Distribution: The plasma protein binding of fenofibrate is very high and is around 98% to 99%. The volume of distribution of glipizide is found to be 10L. Metabolism: Glipizide undergoes hepatic hydroxylation. These aromatic hydroxylation products have no hypoglycemic activity. Hepatic metabolism also yields another metabolite, an acetylamino-ethyl benzene derivative which is reported to have 1/10 to 1/3 as much hypoglycemic activity as the parent drug. Excretion: 10% of the drug is excreted in unchanged form in urine and feces. The remaining 90% of excreted drug is in the form of hepatic metabolites. 80% is eliminated in urine while remaining 10% is eliminated in feces. How long WPI 845 pill stays in the system? The half-life of glipizide is variable and ranges from 2 hours to 5 hours. Therefore the time needed by the body to completely get rid of the drug ranges from 11 hours in some individuals to 27.5 hours in others.